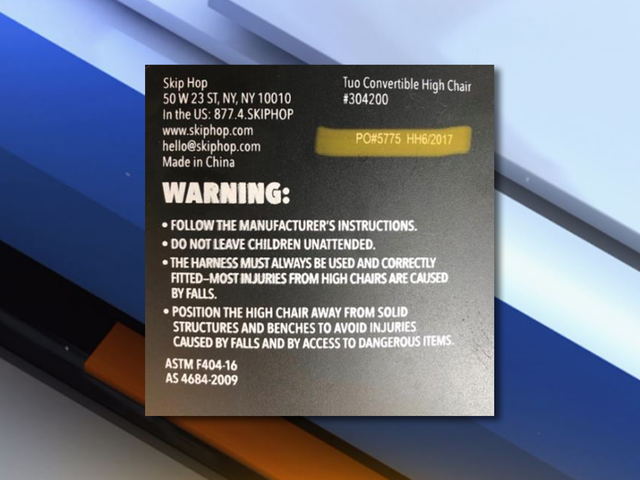 Skip Hop has issued a voluntary product recall for their TUO Convertible High Chairs after receiving feedback from multiple parents that the leg or legs can become detached from the seat, posing a potential fall risk. HH102016, HH11/2016, HH3/2017, HH4/2017, HH5/2017, HH6/2017, HH7/2017, HH8/2017, HH9/2017, HH092917, HH010518, HH030518, HH05182018, HH092717, HH05312018. This code is located on the back of the chair, above the “WARNING” section. The high chairs were purchased between December 2016 and September 2018 in the U.S., Canada, Australia, and Mexico. They were sold in a charcoal gray style and a silver/white with clouds style. In order to get a refund, consumers have been asked to fill out this form and upload two photos. Skip Hop says within 5-7 business days, you will receive an email confirming the shipment of your e-gift card or refund. Skip Hop toll-free at 888-282-4674 from 9 a.m. to 5 p.m. ET Monday through Friday, or online at www.skiphop.com and click on “ Recalls ” for more information.